It’s November, friends, and with that, there are new celebrations to jot down and prepare for (personally and strategically) on your calendar. In fact, Thanksgiving isn’t the only holiday worth noting this month! November also marks National Entrepreneurship Month, and within it, we’ll actually celebrate a specific National Entrepreneurship Week and National Entrepreneurship Day! Not only is this a chance to take a few moments to high five yourself and anchor into the work you do to create something (a product, a service, a website) that didn’t exist before in the world – helloooo pretty amazing when you sit down and think about it – but it’s also a solid content theme that opens you up to several opportunities to build buzz and visibility for your business, your brand, and yourself! 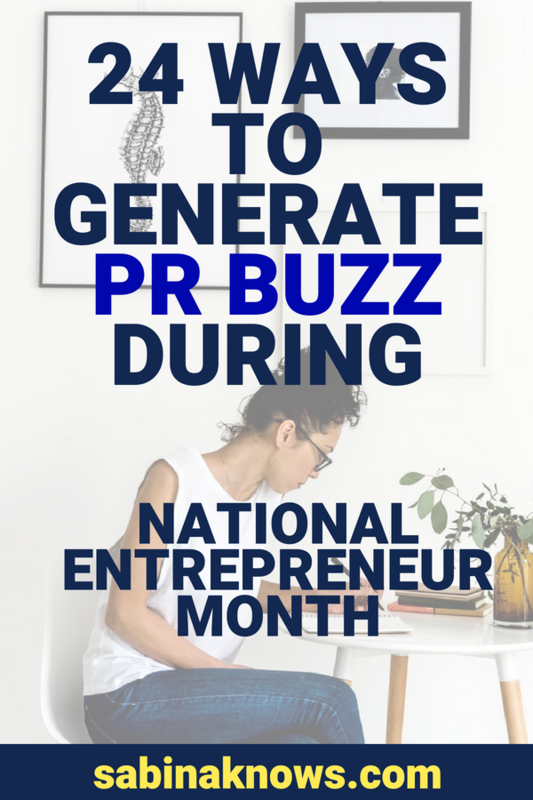 Before you let out an exasperated sigh that translates into, “I have no time nor brand power left to create any more clever PR or marketing strategies” let me throw you a small business life raft in the form of a list of 24 ideas ALREADY CREATED FOR YOU! I also hosted a Facebook Live Chat about all of these ideas which you can watch right here in our Facebook Community: Watch Facebook Live Strategy Chat. That’s right, just call it my National Entrepreneur Month gift to you! Below you’ll find 24 Steal-worthy ideas you can apply to your blog, social media feeds, newsletter, and public relations campaign throughout the month of November. Don’t let this holiday that is literally made to celebrate you – and share the work you do – go un-celebrated in your PR and marketing plans. Dive into the ideas – and print them out in checklist form – today! Let’s begin by talking about content, buzz, and marketing ideas you can control. We’ll dive into publicity ideas – something you cannot fully control the result of – next. In this part of our list I’m going to combine quick ideas you can incorporate into content that is 100% controlled by you. The only thing stopping these buzz-building opportunities from happening is you! What I love about these content-delivering platforms is that they are powerful places to control and share not just content, but your own personal narrative, story, and your expertise. The more you can personally connect with readers and customers (current and potential), the more they will like and trust you, and thus your business. FIRST: Note that when I say expertise, I’m not only speaking to experts. I’m addressing everyone reading this – whether you make goods or offer a service – as by virtue of working in a specific niche, you are most likely an expert with valuable information to share from within that niche. SECOND: Remember that this is a holiday and a topic from which you are guaranteed to have some type of expertise or anecdotes to share – no matter what stage of business you’re in –because we’re talking about entrepreneurship. YOU are an entrepreneur. And even though on the inside there are times that you may feel messy, stressed, a case of imposter syndrome creeping in, or less than #PRSexy, to so many others, from members of the press to members of the content-consuming public, you’re an inspiration. You are doing what they wish they were doing. You are doing something they’re curious about. So don’t be afraid to share your story. Don’t hold back! This is YOUR month! Pull back the curtains of your business and share snippets and stories (more personally than usual) from your own entrepreneurial journey. This could mean sharing your why, what it felt like the moment you made your leap, it could be introducing members of your team on a more personal level – there are so many options. The goal is to let people into parts of our business they don’t normally hear about or see. Invite us to invest more in your story by sharing some of the big highs and lows along the way, and what you’ve learned from them! Share highlights, celebrations, and perhaps share some challenges you have faced throughout your entrepreneurial journey. Before you tell me, “I shared that major press moment/licesnsivng deal/retail score 2 years ago” please remember that those who have heard may have forgotten, and so many more probably missed it completely. Show pictures from your the early days of entrepreneurship – and then up the value by sharing lessons you learned from those early days. You can share everything from how you bootstrapped to what your first office (even if it’s where you still are right now) looked like. I myself recently found a photo of my work I.D. from my job right before I made the leap into my own business. Can you see the utter despair on my face!? Wow, what a difference passion makes. Side note, this is also a lesson in the fact that I was never meant to be a brunette nor try to darken my hair at home. But that’s another story for another day. Take people behind the scenes of your biz – into the creation process, into your systems and work structure, into who does what at your office, a sneak peek into what’s coming in 2018 – you name it! This is one of my favorite things people from all types of businesses do because I, like most people, want to see what goes on behind-the-scenes. What has worked for you in terms of improving your business, your productivity, or your workplace satisfaction? Share business-to-business advice geared towards other entrepreneurs and small business owners. You can do this on your blog or via a series of posts on other social media platforms. National Entrepreneurship Month Promotions and Exclusive Sales. Who doesn’t love a good deal? Especially during the start of holiday shopping season! No need to wait until Black Friday, Small Biz Saturday, or Cyber Monday to share some sweet deals – let this holiday be an excuse to host a sale! KICK THAT SALE UP A NOTCH: Collaborate with other businesses who share customers that are similar to yours, and host a group sale that includes cross-promotional across your social media platforms and newsletters. At the very least, you’ll exponentially increase your visibility, and an ideal result will be sales and the acquisition of new customers! Want to connect with potential collaborative partners? Hop into our Press for Success Facebook Community and put out the call for cross promotion! An Instagram RE-introduction – Do you know what I LOVE that people (read: strategic entrepreneurs and self-promoters I follow) do on Instagram? I love when they share a “getting to know me” post that includes “mini paragraphs” or quick sentences separated by spaces and bullets that re-introduce them to their growing follower community and shed light on who they are both personally and professionally. Your key to success with this option? Don’t make this an abbreviated resume. Share PERSONAL tidbits of information as well. This option is quick and simple to execute – all it requires you to do is find (or take) a photo of yourself (no fancy headshot required) and talk about a topic you know more about than anyone in the world – yourself. Easy content, powerful, connection-building impact. Interview OTHER entrepreneurs (biz friends, colleagues) on your blog about lessons they have learned throughout their business journey – or any other topic that piques your curiosity. You can do this with one person or a few, and before you assume this is a difficult task let me assure you that it’s actually quite the opposite. Not only does interviewing someone else put most of the content-creation ball in their court (you’re only writing the questions down) but when you share it (whether on your blog, on social media, on your YouTube channel – whatever works for you) they’ll share it as well meaning they will drive new traffic and eyeballs over to your website and/or social platforms. KICK IT UP A NOTCH: Do the interview (on camera) with another biz owner. No, you don’t need a fancy set up, studio, or production budget. You can do this in person via iPhone or iPad OR you can host it remotely using Skype with eCamm call recording! Interview each other, share anecdotes, personal stories, or tips – whatever both of you think your audience would get the most value out of, about which you both can speak comfortably. Gear this to your customers, the public, OR other biz owners. Again, it’s an engaging and personal way to connect with people, and can be done in less than an hour! It’s also an excuse to connect with another fellow human during the day – something we don’t always do as busy business owners! Give something away. WHAT?! Oh yeah, I’m especially looking at all of you experts out there. Give away an eBook or a PDF of tips, a free webinar, or something else of value. Remember, it’s in giving of value that we receive the trust and support of our ideal audiences and customers. If promoted successfully, this gift could also well lead new readers and potential customers to your website, newsletter, and social media streams! Do you have a brick & mortar location? Host a National Entrepreneurship Month party! This could also be in conjunction with a celebration sale, a pop up shop, a potluck – there’s no wrong way to celebrate. Invite friends, colleagues, the neighborhood, have door prizes…I’m already excited for you! Now that you have a lengthy list of ideas you can use across platforms that you have total control over – the only limits for the above are your mind and your bandwidth – let’s talk about opportunities you cannot control or guarantee, but that are worth it if you have the time to put into them: National Entrepreneurship Month publicity strategies and ideas. I GET IT! I know that publicity can be challenging, from the background work you must do (finding contacts, writing pitches) to the actual pitching process, which can be taxing on your time and your emotions. But gals and guys, it’s oh-so-worth-it when you finally execute the pitch. And, you heard me correctly, I didn’t say when you land the opportunity, I’m talking about when you simply put yourself and your pitch out there. In the first place. Why is that the real win? Why does it matter so much? When you start the act of reaching out (to pitch, to find contacts) you automatically begin to build relationships. You also begin to build courage – publicity courage! The act of outreach sends out a “HERE I AM” beam into the media world about your business which could lead to future publicity opportunities. You build and improve your public relations skills each time you use them which means the next time you bust them out you can execute this type of work faster and more effectively. So yes, even when it doesn’t go “your way”, perhaps it is going your way. And for that reason, I’d argue that it IS worth it to take advantage of holidays and celebrations that you can “hijack” or “piggyback on” like this one that once again, celebrates and highlights something you are doing, every single day. One more argument/push to convince you to attempt outreach this month: National Entrepreneurship Month is a timely and strategic reason to reach out to and connect with your local media during this first half of the month, who you can then circle back with near the end of the month when Small Biz Saturday rolls around. Now, when you make this latter form of outreach, your name may be a little bit more familiar. You’re no longer a stranger to them! A quick note before the ideas keep on rolling: Please be clear that because we’re in the thick of National Entrepreneurship Month right now, this type of opportunity is considered “short lead”, it’s happening right now, not months from now. That means the media you’ll be addressing will be television (I’d lean towards local), newspapers, and dot-coms (website, blogs). This type of opportunity – in my opinion – is best leveraged with your local press. Everyone loves a hometown hero local inspiration, and that is exactly what a small business owner and his or her story can be. Use this month as a chance to share your business story locally, or share “mainstream biz tips” (tips everyone can use, not strictly fully active business owners) with your local press – meaning local newspaper and TV stations. Share your “I went from this to that” story: Meet the local entrepreneur who went from retiree to celebrated local chef. Meet the former high school teacher turned PR agency owner who now teaches entrepreneurs how to get publicity (ahem, ME!). Former Wall Street banker turned cookie baker: Meet Local Entrepreneur Elizabeth Smith of Liz Bakes. Meet the local (business owner type) behind the (trend, hot topic, exciting event). Example: Meet the local mom leading one of the hottest blogs in New Jersey. Meet the local author who is making national waves with her latest book. A local business take on a national business story or trend: Local Business Shares What Prep and Expectations for Holiday Sales Look Like This Year. Local Business Speaks Out on National Healthcare’s Impact on Well Being of Humans and Business. Local Business Reveals Big Small Biz Saturday Plans for the City. Band together with a trio of entrepreneurs (similar to option 13 above) from your city and offer to do a panel discussion on a business hot topic – or biz trends in general – for your local TV station. If you host this event at your own office or store it gives the press an exciting and visual space to film in – often increasing your chances of publicity success! Share your success story with your local press. Yes, friends, I said your success story. Often we don’t think we have a “worthy” story because we’re in the thick of it – the thick of our biz that is – but plenty of people will love to hear about the local biz who has turned their ideas into an actual business, who is landing awesome press, who is selling on Amazon…Hello, that person is YOU! Share “Mainstream Business Tips” rooted in your own expertise and business. For example, Idea Execution Coach Candi Obrentz could offer tips on how anyone can take an idea and begin to turn it into an actual business or product. Another example of sharing “Mainstream Business Tips”: Kathryn Brooks, founder of She’s Her Own CEO and an expert on working your day job while going after your dream job, could speak about how this coming year you can begin moving forward on your business dreams while holding down your current full-time job. B2B (Business to Business) Tips and advice you can share with short lead business press (think Forbes, Entreprneur.com, Inc.com, BusinessInsider.com and so forth. This is the ideal time of year to share big-picture business tips such as: How to be a better entrepreneur, How to lead like a wise and fair boss, How to work with your spouse and make it work, and so forth. Most of these outlets clearly outline how they accept contributed content, and their editorial teams aren’t hard to track down. It only takes a little bit of sleuthing on their websites. Celebrate yourself: YES, I’m serious. I want you to pencil in (or type in, or Siri in) a moment or two during which you can anchor into your successes. Think about them, acknowledge your hard work, and reward yourself for it, whether that be a hot bath, a dinner out, a celebratory glass of champagne. remember, victories of all kinds and sizes are worth celebrating, and this is a great month to commit to making that happen! Schedule some downtime. What? But you have no time! Yes, you do. and your brain needs it. Try to schedule in extra downtime this month, whether it means a long walk before work begins, lunch outside of the office/house or away from your computer. The more you give yourself opportunities to unwind, the more your brain and creative juices will reward you! Invest in your community! Use this month as a reminder that it’s imperative for you to NURTURE and CONNECT with others around you! The community around you is everything in business, it impacts each aspect of it, from success to (mental, professional) survival. Don’t forget, if you’re looking for a place to connect with hundreds of other like-minded, encouraging, and publicity-focused business owners, hop into our private Facebook community and you’ll find just that! 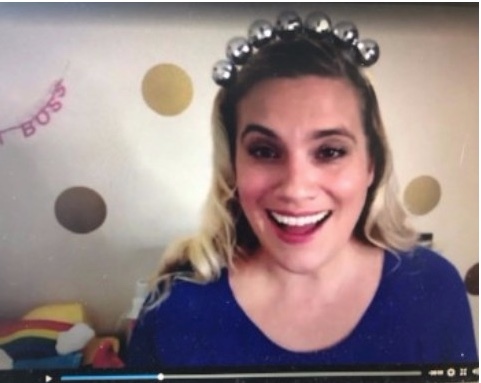 Want to watch me in a recording of a live Facebook chat (wearing disco balls on my head) diving into these topics on camera? You can catch it anytime in our Facebook community. Access the video chat by popping right in HERE!